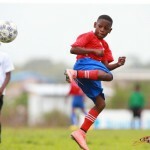 It took less than 30 minutes for DIRECTV W Connection to brush aside a woeful St Ann’s Rangers outfit in Couva this evening, as the “Savonetta Boys” cruised to a 5-0 triumph which took them to within one point of the Pro League’s summit. 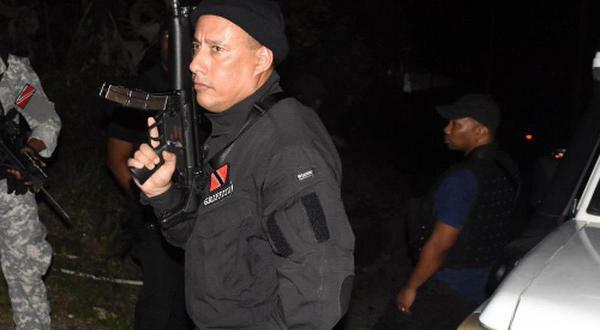 In today’s other fixture in Couva, Point Fortin Civic registered their first points of the season outside of Mahaica Oval, as they shot down table proppers, Club Sando, 3-1. While, in Malabar, early leaders North East Stars lost their second outing in the space of four days to slip from first to fifth after a 2-1 defeat to Morvant Caledonia United. After six league games this season, there are only two points between the top six clubs and current leader Defence Force will do well to still be ahead by the New Year. Connection, who are now third and just one point adrift, are certainly showing the appetite for trophies this season. Although it might be unwise to read too much into their win against a painfully outclassed Rangers outfit. It took just 65 seconds for Rangers coach Angus Eve’s game plan to go out the window, as Connection attacker Shahdon Winchester spun on an opponent and teed up Jomal Williams for an emphatic finish inside the opposing 18-yard box. 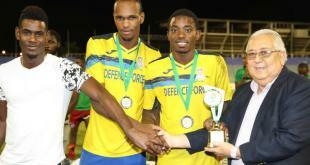 Photo: W Connection attacker Jomal Williams (left) places past Defence Force goalkeeper Sheldon Clarke and defender Jelani Felix to put his team ahead in the 2015 Toyota Classic final. 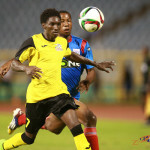 And Williams doubled Connection’s lead and his own tally in the 19th minute, as he drilled his shot in off the far post after an assist from marauding St Lucian left back Kurt Frederick. Veteran playmaker Andre Toussaint ought to have made it 3-0 in the 26th minute but somehow steered wide from six yards after another Winchester cross. But, at this rate, it might have felt like shooting practice for Connection’s front four. Sure enough, the Savonetta Boys did not have to wait long for their next opportunity, as Frederick whipped in a cross from the left flank and Winchester converted with a brave header in the 28th minute. The game was just a half hour old when Eve made his first change. And it was instructive that he withdrew midfielder Kevon Piper for another defender in Shaquille Moses. If it were a boxing match, the Rangers coach might have thrown in the towel. 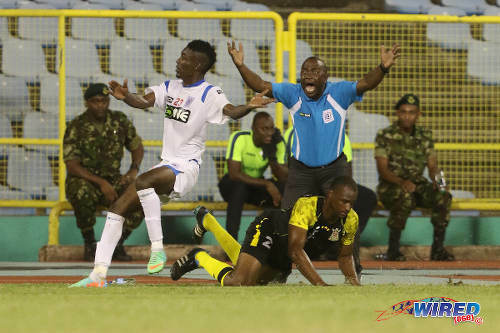 Photo: St Ann’s Rangers coach Angus Eve rages at the referee after Sayid Freitas (left) is whistled for a foul on Defence Force stopper Glynn Franklin in 2015 Pro League affair. Thankfully, Rangers goalkeeper Stefan Berkeley, who followed Eve to the St Ann’s club from North East Stars, was not about to shirk his own responsibilities and pulled off some vital saves. Williams got the fourth, two minutes into the second half, as he finished expertly after a fortuitous deflection presented a one on one opportunity. And Winchester closed the score summary from the penalty spot in the 84th minute, after referee Gyasi McDonald whistled for a clumsy handled ball by Rangers defender Jelani Peters in his own 18-yard box. Connection coach Stuart Charles-Fevrier could not have imagined a better way to spend his Saturday evening if he tried. 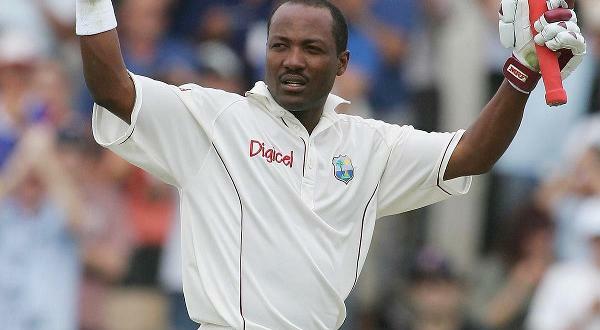 Club Sando and Point Fortin have not been having much fun this season. And both have seen their famous support base dwindle away drastically in recent weeks. 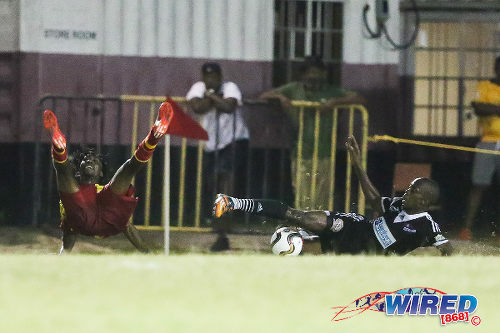 Photo: Central FC attacker and former Point Fortin Civic star Marcus Joseph (right) floors former teammate Akeem Redhead with a tackle at Mahaica Oval in 2015 Pro League action. Point Fortin players left the field in smiles though. Well, most of them did. Somehow, midfielder Glenn Sutton managed to pick up two yellow cards in as many minutes—both for impetuous challenges—despite Civic being two goals ahead at the time. It meant a nervous closing 25 minutes for Civic coach Leroy De Leon and Sando did win and spurn a late penalty, which was taken by striker Kevon “Showtime” Woodley. 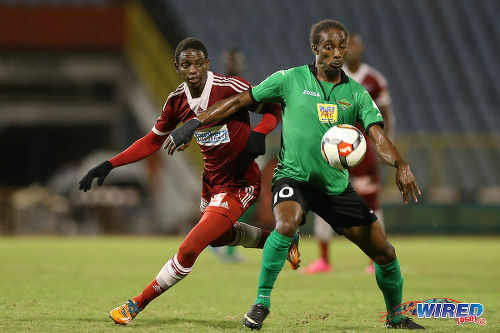 But Point Fortin held on for a 3-1 win. Arguably, the scoreline flattered the victors. Sando struck first this afternoon as Woodley tucked home a low cross inside the opposing penalty box. And, although the lead lasted barely two minutes, the newly promoted Pro League club had at least as many chances to take a point from the game. Instead, Point Fortin custodian Miles Goodman made two vital saves from Woodley—one from the penalty spot—while Sando winger Shaquille Holder thumped an effort off the bar. Photo: Club Sando striker Kevon “Showtime” Woodley holds off a Morvant Caledonia United defender during the 2015 First Citizens Cup third place play off. And Civic were not as wasteful, as Boatswain superbly sprung the offside trap to collect a long ball from left back Andrei Pacheco in the 53rd minute and rounded Sando goalkeeper Kelvin Henry to score. 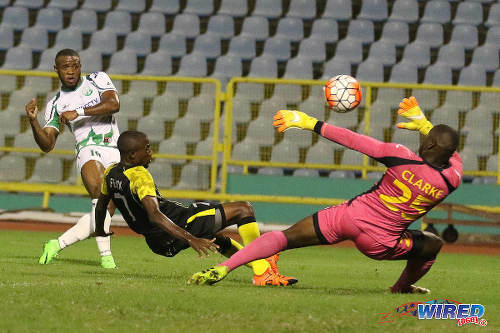 While, in the 60th minute, Pacheco drilled home from the penalty spot after Sando defender Coneal Thomas impeded Shackiel Henry. Sando midfielder Akeem Humphrey, who had to settle for an appearance off the substitutes’ bench as he recovers from the virus, injected some life into the San Fernando-based team. And it was Humphrey’s trickery—he flicked a rolling ball over Sutton and then hooked the ball back the other way to draw a foul—that sparked the Civic midfielder’s minute of madness, which led to two quick bookings. But it was too little too late for Sando who stayed bottom while Civic leapfrogged Rangers to seventh place. 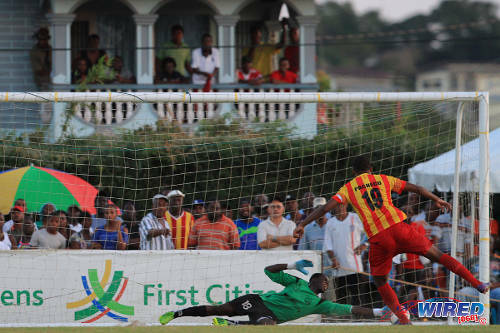 Photo: Point Fortin Civic player Andrei Pacheco drives a penalty past W Connection goalkeeper Julani Archibald during 2013 First Citizens Cup action at Mahaica Oval. W Connection (4-2-3-1): 18.Julani Archibald (GK); 21.Shannon Gomez, 3.Gerard Williams, 5.Triston Hodge, 2.Kurt Frederick (23.Kevon Goddard); 8.Briel Thomas, 13.Kion Joseph; 21.Neil Benjamin Jr, 14.Andre Toussaint (19.Dwight Quintero 60), 10.Jomal Williams (12.Dimitrie Apai 65); 9.Shahdon Winchester. Unused substitutes: 1.Terrence Lewis (GK), 4.Maurice Ford, 17.Aikim Andrews, 46.Anfernee Frederick. St Ann’s Rangers: 1.Stefan Berkeley (GK); 7.Sedale McLean, 2.Shakiyl Phillip, 4.Jelani Peters, 16.Richard Williams; 5.Miguel Romeo (captain) (17.Kadeem Hutchinson 46), 14.Jemel Berot (11.Josh Toussaint 46); 19.Rasheed Simon, 8.Kevon Piper (6.Shaquille Moses 30), 9.Keron Cornwall; 23.Sayid Freitas. Unused substitutes: 22.Christopher Biggette (GK), 12.Darius Ollivierra, 18.Trevin Latapy, 21.Keon Peters. 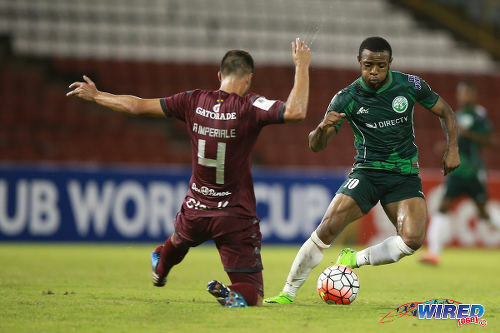 Photo: San Juan Jabloteh attacker Tyrone Charles (right) keeps the ball from Central FC right back Kaydion Gabriel during 2015 Pro League action at the Hasely Crawford Stadium. 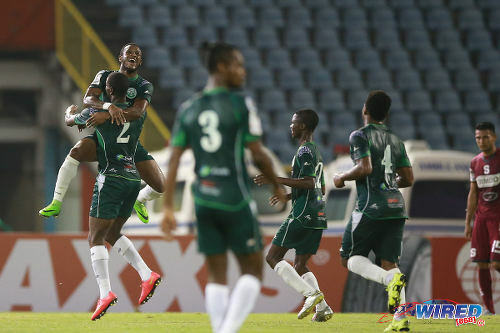 A a…big team Jabloteh boy !!! Lol. Haven’t read it. One person told me about it. Earl has tried to convince me to publish it in Wired868 and I declined. Didn’t think he would still get it published. Haha. 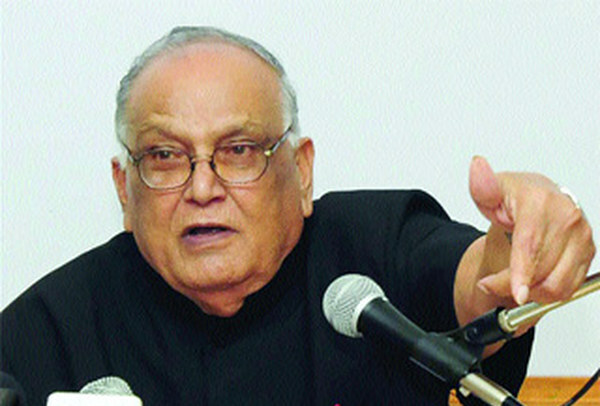 I don’t know what he said. I’m grateful for the sentiment. But I’m very content on my side of the fence. Williams and Connection in ripping form! lol isn’t that his name though? Haha, ok. Dunno what could have been implied. Another player who I forsee will be limited in opportunity because of specializing in a position. Where is he best ? Fevrier says that he’s producing the most from the left wing right now. 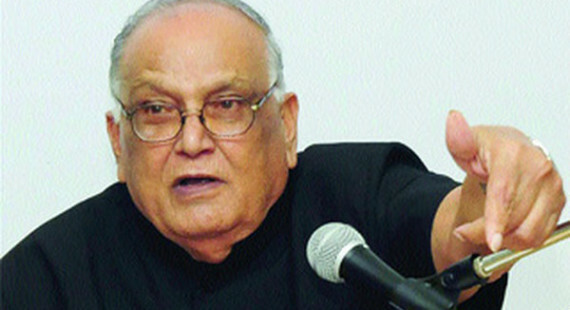 So I assume that’s the spot he can vie for in the national setup.